Acquired on my last trip to the USA, I picked this up from a video games store near where I was staying. It was in excellent condition with only the box showing signs of wear. I also managed to get 5 games for it unfortunately those were not boxed. 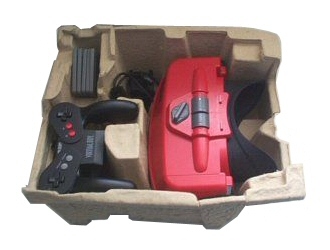 An interesting system, all the internals such as the cartridge slot controller and link ports are in the visor like unit. 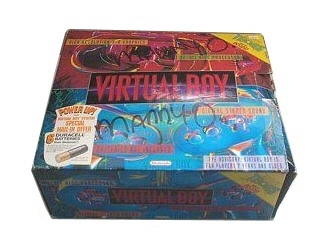 I believe the visor was initially designed to be worn on the head however this version comes with a stand to hold the visor, which is nice because the Virtual Boy isn't that light. Even with the stand it is hard to find a position in which to place the device that is comfortable, as you need to be as close as possible to the visor this ultimately means you're bending you neck no matter how you position the stand. The display is all in red and does actually look 3D, my favorite title for this at the moment is a golf game which I think shows off the 3D part very well. Unfortunately I can't use this for more than 5 minutes at a time as it gives me a nasty headache, not to mention neck ache.